A new documentary called “The Forgotten Farragut” explores the effects of gentrification in DUMBO on the nearby public housing development. BROOKLYN — A new short documentary aims to make sure public housing residents in Vinegar Hill aren’t forgotten in the face of rapid development. “The Forgotten Farragut” — which was released last month by social services group Brooklyn Community Services (BCS) — explores the effects of gentrification in DUMBO on the nearby Farragut Houses, where BCS operates a community resource center. The film points out the stark contrast between DUMBO, where the median household income is $204,205, and the Farragut Houses, where the median household income is $20,169, according to BCS. The 9-minute movie features current and former Farragut residents sharing personal stories related to several neighborhood issues, including employment, decaying infrastructure, access to affordable food and education. They speak about the lack of resources available to community members, saying the housing project is often overlooked. “I feel like Farragut is a lost city,” says one resident who was interviewed for the film. The complex, which opened in 1952, houses more than 3,400 residents — 60 percent of whom live in poverty and 12 percent of which are unemployed, according to BCS. The film’s executive producer, Sonya Shields, said BCS chose to highlight Farragut Houses residents to give them a voice. Shields said the documentary also shows residents the impact they can have on their own community by featuring former residents who have returned to the complex to create children’s programming and public art. “Some of [the residents] are not just moving ahead in life, but coming back to the community and improving it and not forgetting where they came from,” the producer said. BCS received a $10,000 grant to make the film through the “Portraits of New York City: Small Grants Challenge," sponsored by the Human Services Council and Measure of America. 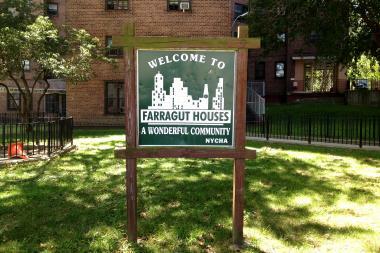 To learn more about BCS’s community center at the Farragut Houses, click here.